Bring the beauty of rustic furniture indoors with this lovely table lamp. Each piece is one-of-a-kind, using traditional joinery methods to build a natural piece that will last for ages. A gorgeous piece that is full of personality and character. Featuring a wagon wheel and metal lantern! 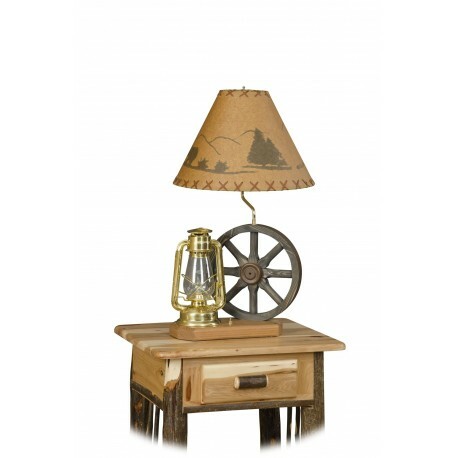 A versatile and rustic antique-looking table lamp. Great for the living room, lounge, office, or bedroom. Shipping: Ships via Ground, Fully Assembled.